It didn’t take long for the spectator value to wear off and uneasiness to set in. 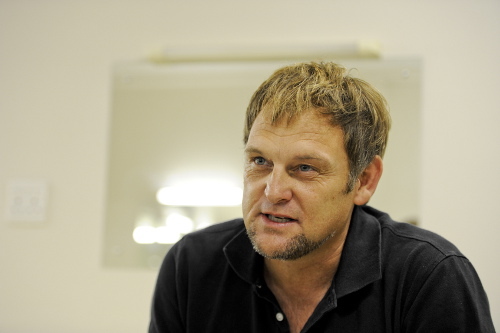 My mind flooded with questions: If Hofmeyr hadn’t even applied to participate in the 2015 KKNK, was it really necessary to bring the dude back into the public’s attention? Don’t we all know that any publicity is good publicity? Steve surely knows this and it didn’t take him long to land a few interviews with the press, a half page article in the weekend’s newspaper, and a good bit more of media coverage with his response to the KKNK’s slight. Personally I hold to the behaviour modification theory that says good behaviour should be rewarded while negative attention-seeking behaviour should be ignored. In terms of fundamentalist loons I wish the media would simply disregard their blabber, let them scream and shout their bigotry in an isolated little corner where they belong, so the rest of us can focus on more constructive matters, say, nation building? I’m confused. When did the nation of South Africa become an archipelago, a collection of islands that is in need of bridges in order for dialogue to take place? Are we, as different cultural groups in South Africa, to think of ourselves as separated from each other by great volumes of ocean? No man is an island, said Thomas Merton and John Donne, and neither are we. I get the intention of the KKNK’s “building bridges” metaphor, that it is aimed at reconciliation and dialogue, but I just don’t think that this metaphor is very helpful. A bridge-building metaphor, however well meant, does not help us to get us beyond the rhetoric of us-against-them. Despite a huge diversity of cultural values and worldviews I would like to think of myself planted firmly on the ground right beside other residents of South Africa. We may be a ragtag collection of people but I believe that most of us have one thing in common: we are all striving to make a dignified living through which we can provide our families with safety, security, and a better future. See? No bridges needed. We want the same things. And, whether we like it or not, our fate as individuals depends on the state of our nation. We are in this together. We may still have tons of unresolved baggage which is too often just branded over with a rainbow stamp, accompanied with the expectation that New South Africans walk around holding hands, swaying along and singing Kumbaya. All the same, the fate of this nation depends on whether we have each other’s backs. Dan Harris writes: “The new view took into account a long-overlooked branch of Darwinian thinking, namely the observation that tribes who cooperated and sacrificed for one another were more likely to ‘be victorious over other tribes’. Apparently nature rewarded both the fittest — and the kindest”. With the challenges in front of us we cannot afford standing on different sides of the river when we are battling to keep our families clothed, fed and secure, our debts paid and our children educated. United we stand, divided we fall. To the KKNK I’d like to say: Thank you for your public commitment to the values of reconciliation and dialogue. Kudos to you for taking a stand against anything that could possibly be considered hate speech. But now, can we please progress beyond a worldview of us-versus-them and join in our common interest; a better future for us all. As stated so eloquently by Stephanie Doyon, let us remember, “Right-minded people know that success for one is success for all; that in this dark world a little happiness in a single life is a victory for the common good”.